The Wolfpack presents a story you’ve heard before: awkward teenagers binge-watch movies. Heck, you probably live that story yourself, and I suspect that much interest in the film (this reviewer’s included) stems from the instant empathy film fans are likely to feel with its cinematically-obsessive subject – the six Angulo children – and its contrast with their atypical, arguably bizarre home lives. The kids grew up in physical isolation, forbidden to leave their apartment by their father. They dress and talk like characters in Reservoir Dogs. They recreated The Dark Knight with costumes built from cereal boxes and yoga mats. The Wolfpack promised a ticket to an island permeated by pop culture, a comparative study of greater American culture in which isolation is the variable and movies are the control. Unfortunately, as a film The Wolfpack is frustratingly superficial. The film’s existence is of course a small miracle, an auspicious launch for the career of director Crystal Moselle, who not yet in her 30s has a film in international distribution and a Sundance U.S. Documentary Grand Jury Prize. Moselle is exceptionally reluctant to probe her subjects, nor does she speculate about further implications of their experiences. The result is a film that’s amiable but feels negligently noncommittal, a project whose seeming desire to remain at a respectful distance winds up raising myriad practical or thematic questions it cannot answer. Unwilling to drive the film in any definite direction, Moselle creates a void that gets filled by conventions and obliqueness, ultimately becoming an example (as well as a depiction) of how insular communities develop at familial, cultural and urban levels. While the film does depict – the access its able to grant – is fascinating. The kids’ mother, Susanne, was a Midwesterner who fell in love with a Peruvian trail guide, Oscar. His subsequent ambitions included heavy drinking, siring ten children just as Brahma did (the couple made it to six), and generally becoming a shut-in conscientious objector to society. He is presented as an emotionally-distant monarch of a very small abode, who rationalizes that he was offering his children freedom by keeping them out of the Rat Race. Susanne – dazed in home movies, warm in interviews – apparently earned enough money from homeschooling supplements to allow the family to subsist, sequestered in their Lower East Side apartment, in a state of extreme, dialectical rejection and dependence on American state and society. The family maintains two windows on the world: films, and a literal window view of the Empire State Building. The movie presents the Angulo children as a collective. They don’t really emerge as individual personalities, for better or worse a deliberate creative decision. When amongst each other, they speak with the intimate, informal familiarity of siblings. In interviews, they talk a performative, articulate cadence reminiscent of media personalities. In public, they use a stylized wise-guys patois appropriate to their Reservoir Dogs inspired fashion. In their home movie, they’re actually pretty good actors. As directors, they’re more focused on performance than cinematography. They talk about film, but they don’t necessarily drop references. All this raises a lot of questions sadly left unanswered in-text: Why did the ubiquitously-shirtless Oscar seemingly isolate the family in every respect but cinema? How has daughter Krsna’s Turner Syndrome brought the family into contact with medical institutions? Where the hell has Child Protective Services been the last two decades? Where do the kids’ NYC/Tarantino accents come from? Why did the family choose the isolation of a NYC apartment instead of, say, becoming survivalists in rural Montana? What should we make of Oscar’s seemingly muted response when the boys start asserting their independence? All these ambiguities make it difficult to answer the higher-order questions the movie provokes – are these socially-acceptable life choices? Are we watching abuse? – nor does what is presented provide enough detail for us to understand the family dynamics in their own right. The Angulos’ hesitantly-explored relationship with greater American society is most readily metonymic in the questions that remain about their relationship to film. Among the siblings’ favorites are Pulp Fiction, The Dark Knight, and 80s slasher films, the kind of movies that constitute the basic entry canon for teenage boys becoming film obsessives. How did such interests develop parallel to the rest of American culture in relative isolation? When one brother states that “most people consider Citizen Kane the best movie ever made,” who does he mean by “most people”? How are the brothers aware of critical consensus? What value do they see in it? One brother explicitly posits film-making and watching a means to escape the apartment, but such moments are taken as points in and of themselves. Much of the film’s lack of detail is the result of stylistic decisions, a case of directorial approach not quite being conducive to the subject matter. The film’s presentation mostly alternates between Moselle’s interviews and the family’s home movies. It largely feels like an incomplete example of a conventional narrative documentary, with fragments of a more experimental, collaborative, abstract, and altogether more interesting film sprinkled throughout – especially in the brother-directed short film at Wolfpack’s end. There’s little tension or arc to the happenings, perhaps ironically due to the fact that the director met the brothers at a point where they were leaving the apartment with increasing frequency. As a result, their lives of isolation existed increasingly in the past throughout the film’s production, and their tentative steps into the world lack direction. A story arc and context are not necessary or even desirable in documentaries. The landmark Grey Gardens (1975) – to which The Wolfpack has been compared – lacks them to its benefit. This is because how that film’s subjects came to live is abject poverty is a fascinating story, but to discuss it would distract from the film’s primary focuses: exploring the immediacy of the Beales’ situation, their tense mother-daughter relationship, and the personality that’s revealed as they ‘perform’ to the camera. It’s rich in the ethnographic-like co-presence – time spent being with interlocutors in normative situations – that The Wolfpack lacks. When the latter film does document events as they are happening –first trips to the beach and the movie theater – it’s hard to compare their experiences to the day-to-day isolation we’ve never seen, outside of the stylized performances of film recreations and birthday videos. Especially given the way film is positioned in its subjects’ lives, applying a quasi-conventional narrative structure to their story seems itself a form of cultural insularity, a recreation of The Other in the image of the familiar. 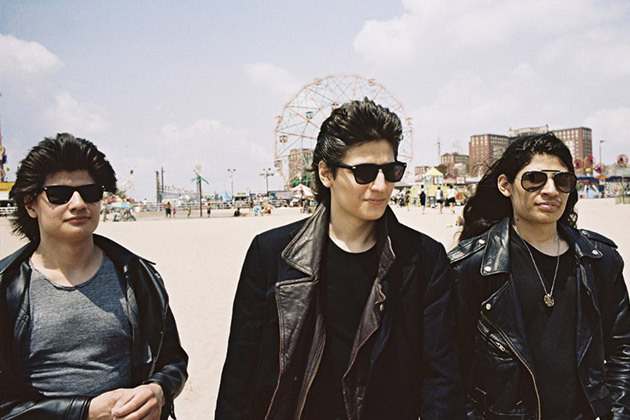 The Wolfpack shows subjects with a notably uneasy relationships to American culture, but largely exists within the framework of American cinematic expectations. When the film soundtracks the boys dancing to Baltimrora’s “Tarzan Boy”, it’s unclear if such a decision is organic to Moselle or the Angulos. Is this a moment of spontaneous joy? Are the boys choreographing their increasing independence by imitating the sort of thing they might have seen in a movie? Or is the director interpreting their experiences through our shared expectations for what happens in movies? That the Angulos have apparently moved on to other, non-cinematic interests suggests that they may have discarded the media loop that still entraps us – and indeed, provides more evidence that The Wolfpack’s emphases and interest generated by the film is more substantive of film culture’s self-obsession than the Angulos’ obsession with film. All these ambiguities ought to be particularly pressing for you and I – dear film fans – for we are also woven into this matrix. 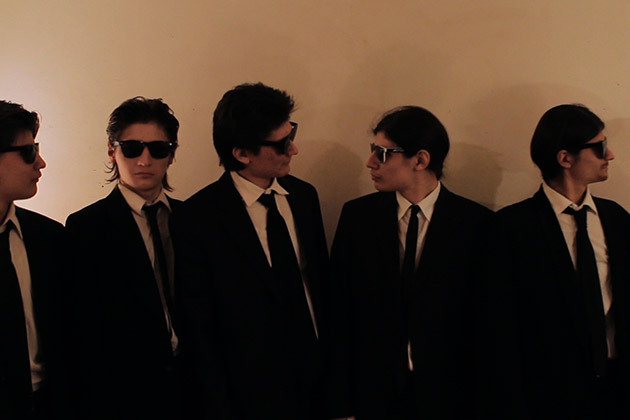 Were it not a documentary, The Wolfpack could easily be satire: a family never leaves their apartment, stares at screens all day, and eventually replicates what they see on even more screens. To the degree the boys’ isolation and fandom is literal, however, it suggests something exceptionally unnerving: film fandom is so generic it can be replicated in a vacuum. Yes you, Film Fan of Certain Age, reading this review of a hot new cult documentary, ye who as a teenager thought Quentin Tarantino was, like, The Orson Wells of Cinema until you discovered his French New Wave influences. Even in the most obscure recesses of America – an apartment in New York’s Lower East Side – there are children who have scarcely seen a tree but whose paeans to Christopher Nolan sound disconcertingly familiar. To the extent that we do not take these elements literally, we must acknowledge that that perhaps the most vital parts of the Angulos’ lives are not in The Wolfpack. These are debatable readings of the film, albeit ones enabled by the film’s lack of a definitive direction of its own. They are also perhaps usefully read in light of how two recent fiction films have replicated the tics of the ‘movie fan’ with unnerving specificity, with the aim of critiquing them. I write of the urban hipster enthusiasms coldly catalogued by While We’re Young (2015) and the navel-gazing Criterion Collection curation in Me, Earl, and the Dying Girl (2015). Both films’ protagonists start their journeys believing their art is going to be personal, somehow true, the kind of movies smart audiences would enjoy – the kind film buffs might enjoy. Eventually, they realize to their chagrin that their work is of a type, derived more from their own vanities and the expectations of the cultural zeitgeist than their own direct experiences. The subjects of The Wolfpack don’t seem burdened by such insecurities, but the film itself sits uncomfortably alongside them when it ventures out into the world. It’s an entertaining cursory glance of a small world, but neither incisive enough to thoroughly explore that world nor willing to question the implications beyond it, particularly for itself or its audience. It distressingly weaves us further into an urban cinematic middlebrow cultural matrix in which it would confine its subjects.